Five local photographers — three from Joplin — took many of the top honors in the 41st annual PhotoSpiva competition and exhibition now on display at Spiva Center for the Arts in downtown Joplin. “For a national competition like this, that is unbelievable,” Josie Mai, Spiva’s executive director, said of the success of the local artists. “It’s unprecedented. To put the feat in perspective, only five area photographers placed among the 82 winners from 2009 to 2016 in PhotoSpiva, which is the longest running national photography competition of its kind in the United States. “Not trying to be cliché, but it was euphoric,” Huffman said of his win. It was the first time he’d entered the competition, he said. When it was called, he couldn’t really believe it, he admitted. Like so many of the framed images on display at Spiva, Huffman said the image of the man in his winning photo is “exceptionally personal” to him. It’s his grandfather. This year, Joplin husband-wife duo Ron Erwin and Thao Nguyen won third- and second-place awards respectively, Mai said, while Joplin’s Linda Ralston garnered an honorable mention. An honorable mention also went to Carthage photographer Koral Baker Martin. Martin is another professional photographer emotionally attached to her image, “Trails End.” The picture is a side profile of her father, and it was snapped during a hike several years ago inside Cumberland Falls State Resort Park in Kentucky. Following a strenuous hike through the pouring rain, they stopped to rest before driving home. “As my dad hates to have his picture taken, I snuck a shot of him bending over, resting, with water running in rivulets down his hair,” said Martin, who owns Koka Art Gallery in Carthage. Later, when her father was rifling through his daughter’s photos, he came across the portrait. “Shock of all shocks, he loved it,” she said. “Wow. He said it was his all-time favorite photo taken of him.” . Orjan Henriksson selected the nine winners and 62 images currently on display from a pool of at least 200 entrants. Henriksson, who lives in Mullsjo, Sweden, was PhotoSpiva’s first-ever international juror. His latest exhibition, “Auschwitz KZ 1-11,” is currently exhibiting in Spiva Art Gallery at Missouri Southern State University. “It’s just fascinating to look at other photographers’ pictures, to physically see what they saw and, if it is a good photograph, feel what the photographer felt in the moment he or she chose to capture,” he said in a statement. “That is for me fascinating. The local flavor wasn’t restricted to top award-winners; nearly a dozen entrants whose work was selected by Henriksson for public display live in Jasper County. 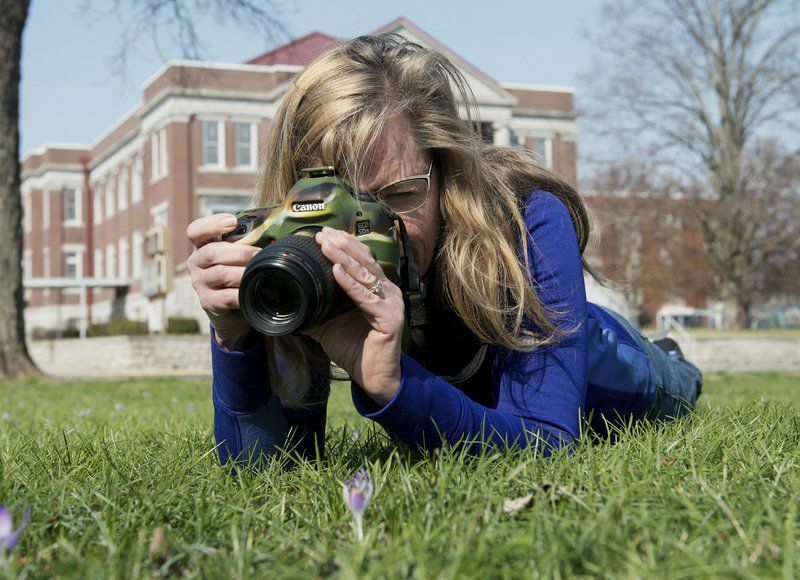 Danny Wilson, a professional photographer from Carterville, entered the competition for the first time this year and said it “was a good day” when he learned that his image, “In Living Color,” had been accepted. The 62 selected PhotoSpiva 2017 photographs are on display to the public until April 30 inside Spiva’s main gallery at 222 W. Third St. The exhibit is free. ind up in a hospital, where they’re needed most.